If you love eating rice and eat a lot of it, then you should definitely read this guide on the best rice cooker brands! Nowadays rice cooker comes with many functions, and they are very fashionable too. Some of the countries that championing in the making rice cooker are like the Japan and Korea. That is why you can easily find Japanese or Korean rice cooker brands in any electrical outlets. This handy yet powerful appliance can take out all the hard work and also help you avoid soggy, undercooked, mushy or burnt end results. Do you know that rice cookers were one of the most popular and essential kitchen appliances used in Japanese or Korean kitchens since 1955? The first company to introduce rice cooker in Japan was Toshiba. How Does Rice Cooker Work? How to Pick the Best Rice Cooker? Japan, Korea, and China still make some of the best rice cooker models, and this fact should not come as a surprise as this is a country where people live on a rice diet. Still wondering how this incredible kitchen machine can make your life easier? How does it work? Which is the best rice cooker brand? In this post, we will discuss all of them. So read on! While you can readily get your hands on some of the best rice cookers made in Canada, Japan, USA, and China. 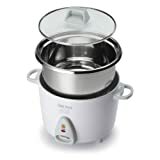 But if you are in the mood to get a rice cooker that is fashionable and has multiple functions, then the Korean rice cooker brands like the Lihom, Cuchen and Cuckoo﻿﻿﻿﻿ Electronics will be your best bet as these brands have some of the fanciest and sophisticated rice cookers for you to choose. Some rice cookers come with attached lid while other comes with removable covers. Working off a rice cooker is simple. After you have placed water and rice in the inner cooking pot, put it in the rice cooker and close the lid. Turn on the heating element by flipping the switch. The heating plate inside the cooker begins to heat up the water. ​The water is heated to its boiling point and stays at the same temperature. The rice grains soak up the hot water and steam and begin to get cooked. After all the water has been absorbed, the temperature will begin to rise again. At this point of time, either the cooker will be switched off, or it will turn to warm setting. In a rice cooker, you can easily cook a lot of delicious delicacies apart from cooking rice. It works by transferring heat from the heating element to the cooking pan and cooking the dish. The time it takes to cook food can change depending on a number of factors, with the material use to make the inner cooking pot being the most important factor. The cooking pot made from aluminum or copper is the best as they are more conductive and heat up quickly as compared to other materials. After all the water has been absorbed, the rice cannot cook further in a rice cooker as the thermal sensors detect that the temperature has reached 100 degree Celsius. The sensor automatically shut-off the switch which immediately stops the cooking process. Thus, rice cooker prevents overcooking or burning of rice. Some Japanese rice cookers are equipped with something known as fuzzy logic. To understand this term, we need to go back to 1965 when the fuzzy sets theory was born. A UC Berkley professor named Lotfi Zadeh came up with the theory which deals with mathematical sets of items. In the sets, the element either belongs to a group, or it doesn’t. There was nothing in between. However, the fuzzy logic deals with the “in between” things. When it comes to cooking with a rice cooker, the fuzzy logic uses a more practical and humanistic approach. This logic incorporates the idea of almost or slightly to determine doneness. Thus it gives the machine an ability to make judgment calls similar to what a person may think. Fuzzy logic enables rice cookers to have multiple cooking functions. Cookers with fuzzy logic can easily cook brown, white, sweet rice, sushi rice or glutinous rice. Getting your hand on the removable lid will make things easier for you. Wiping out the interior of the cooker with a wet towel will become a breeze. However, the non-detachable lid model has an advantage too. Water from the cooking steam will stay beneath the cover. And when you open the lid, the water will be able to flow into a container whereas a removable lid model does not have such option. Rice cookers that come with a subpar quality of inner coating are bound to peel off quicker. However, if you have picked up a product with high-quality inner pot coating, you can be sure that the product will remain with you for a long time. Look for the manufacturing country of your rice cooker. If it’s made in Japan or Korea, then it’s good. 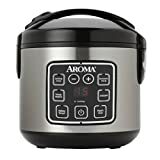 Rice cooker brands from Japan and Korea are perceived to be better quality as these countries have championed the manufacturing rice cooker and made great rice cooker through their many years of R&D. Before you buy a rice cooker, make sure you know the capacity of rice cooker you needed. For small size family or a single person use, you can easily choose one of the best small rice cookers. Using a large size rice cooker to cook rice for a single individual is not efficient. Also, it’s harder to gauge the correct amount of water to use for cooking a small amount of rice in a large rice cooker. One of the most famous rice cooker, Zojirushi rice cooker (made in Japan) comes with a 5.5 cup capacity. The NS-ZCC10 model comes loaded with a variety of menu selections, such as extended keep warm, automatic keep warm and reheat cycle. The packaging includes non-stick rice scooper, 2 measuring cups, ice spoon holder and recipe book. Also, be aware that model number NS-TSC10 and NS-TSC18 may look similar, but these designs are made in China. Like what you read so far? How about help us to spread this AWESOME post to your friend and family? Your shout-out will help to motivate us to create more great posts for you and everyone else. Thanks for your support! This amazing rice cooker can easily handle 6 cups of cooked rice at once. It is made up of 100% surgical-grade 304 stainless steel cooking pot which ensures that the cooker can easily handle the higher heat without burning the contents. It is ideal for cooking soups, jambalaya, chili and so much more. *For ﻿more information abo﻿ut NC﻿﻿S (Net Customer Satisfaction﻿﻿) grade, please ﻿﻿cli﻿﻿ck ﻿﻿here. Out of the three, I would suggest you go in with the Zojirushi rice cooker as it is one of the best rice cookers. This no-frill rice cooker makes it easy for you to cook rice and also a lot of other delicious delicacies in the most convenient manner. While there are many other rice cooker brands in the market but we still feel that the Japanese rice cooker brands are the winner in term of quality and product lasting and the Korean rice cooker brands as runner-up. Join over 1,000 readers who get the best advice delivered straight to their inbox. Hi! My name is Gordan Ladd and welcome to Gordan Ladd's Kitchen - a blog that writes all about my culinary experience. Here you can find all sorts of guides and tips for food and cooking as well as best kitchenware reviews and more. Stay for a while and let me know what you think of my site. Or head over to my blog and see all my awesome posts I have ready for you. Copyright 2016 - 2018 by Gordan Ladd's Kitchen.